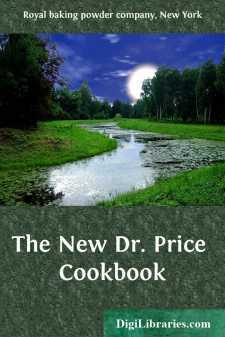 Dr. Price's Baking Powder may be used instead of yeast to leaven bread. It does precisely the same work; that is, raises the dough, making it porous and spongy. The great advantage of bread made by this method is in time saved, as it can be mixed and baked in less than two hours. Milk bread needs little or no shortening, and less flour is required than when water is used. Sift flour before measuring, and use level measurements for all materials. Sift thoroughly together flour, salt, sugar and baking powder, rub in potato; add sufficient liquid to mix rapidly and smoothly into soft dough. This will require about one pint of liquid. Turn at once into greased loaf pan, smooth top with knife dipped in melted butter, and allow to stand in warm place about 30 minutes. Bake in moderate oven about one hour. When done take from pan, moisten top slightly with cold water and allow to cool before putting away. Mix thoroughly dry ingredients; add molasses to milk, and add; beat thoroughly and put into greased moulds ГўвЂ¦вЂќ full. Steam 3½ hours; remove covers and bake until top is dry. Mix and sift dry ingredients; add milk, beaten egg, and melted shortening; beat well and pour into greased shallow pan. Bake in hot oven about 25 minutes. Beat egg and add one cup milk; stir in sugar, corn meal, flour, salt and baking powder which have been sifted together; turn into frying pan in which shortening has been melted; pour on remainder of milk, but do not stir. Bake about 25 minutes in hot oven. There should be a line of creamy custard through the bread. Cut into triangles and serve. Mix flour, graham flour, baking powder and salt together; rub in shortening; beat egg and add with sugar or molasses to liquid; stir into dry mixture and beat well; add more milk if necessary to make a drop batter. Put into greased loaf pan, smooth with knife dipped in cold water. Bake about one hour in moderate oven.